Cee-C has made it clear that no one is worth stressing over and isn't aiming to please anyone but herself. In other news, Cee-C continues to stir the dynamic in a way only she knows how. Despite having been engaged in more than a couple of quarrels, she seems to always find minimal fault in her own actions and much in those of others. Her course of ‘self-justification’ began last night when Anto shifted the ‘separation’ blame from Khloe and pinned on her. As per usual, she didn’t let the blame game slide off that easily and opted to voice it out with Anto who neutrally obliged. Her piece was that people seem to always come at her while all she wants is to restore order by talking things out. Furthermore, she told Anto that she did want a friendship with her, pre-eviction. Anto on the hand reminded Cee-C that the other Housemates’ perceptions of them was quite similar to those of the viewers, despite the viewers having a wider viewing spectrum. On a smaller scale though, Cee-C seems to always refer to being told ‘I don’t trust you’, which is what Tobi kept telling her before they permanently parted ways. Though this is completely open for interpretation, it looks like she isn’t completely over the issue. Thanks to Nina, Cee-C was allowed yet another venting session. The two initiated a conversation that started off as a discussion about Cee-C’s bad dreams and strange sleeping behaviour but ended up a ‘ventathon’. 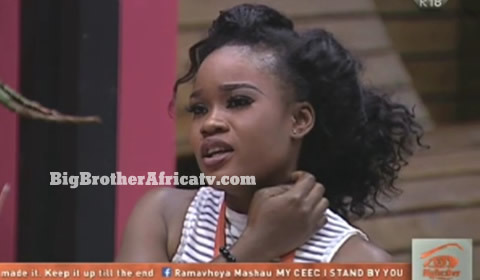 Cee-C explained that she only became vocal because of the amount of pressure exerted upon her in the House, also making references to the first two weeks of the game and how she’d been able to keep her cool; reckoning that the disturbed sleep is caused by stress and therefore needed no intervention of any type. Moreover, she felt that she didn’t need to adjust her personality because people choose to always see he faults. Cee-C has been making somewhat positive moves and tried connecting with the other Housemates but it her efforts are thrown back at her due to the others perceiving them as fake and centred solely around her own gaming ambitions. Her approach hasn’t helped her much though because she continues being a live wire and that alone detonated a lot of the explosives related to her. With just 14 remaining, we wonder if this narrative will change.